An illustration of Anderson localization. 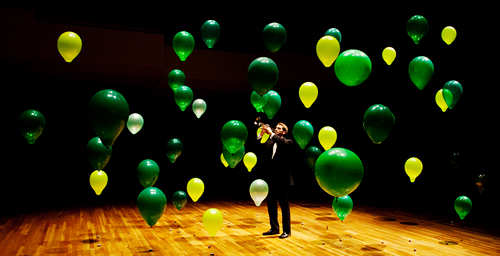 The green balloons represent disordered barriers that localize the sound of the trumpet at its source. CHAMPAIGN, Ill. - University of Illinois physicists have experimentally demonstrated for the first time how three-dimensional conduction is affected by the defects that plague materials. Understanding these effects is important for many electronics applications. 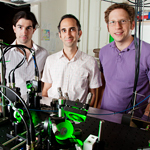 Physics professor Brian DeMarco, center, and graduate students Stanimir Kondov, left, and William McGehee were the first to trap waves of quantum matter in three dimensions. Led by physics professor Brian DeMarco, the researchers achieved complete localization of quantum matter waves in three dimensions, first theorized roughly half a century ago. The group published its findings in the Oct. 7 issue of the journal Science. Defects in materials are inevitable, but their effects are poorly understood. Understanding how disorder in a material affects waves traveling through it has implications for many applications, including ultrasonic waves in medical imaging, lasers for imaging and sensing, and electron waves for electronics and superconductors. The impact of disorder on waves depends strongly on their energy in three dimensions. 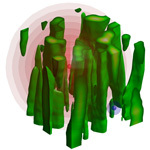 The high-energy red wave can freely propagate outward through the disordered green laser in the experiment, but the low-energy blue wave is trapped, or localized, by reflections from the disorder. "The physics behind disorder is fundamental to understanding the impact of unavoidable material imperfections on these kinds of applications," DeMarco said. Scientists have long theorized, but never observed, that strong disorder causing interference on all sides can trap a matter wave in one place, a phenomenon known as Anderson localization. According to DeMarco, this is analogous to a trumpeter playing in a concert hall filled with randomly placed barriers that reflect sound waves. Instead of traveling in all directions, the sound stays at its source, never propagating outward because of destructive interference. "The result? Perfect silence everywhere in the concert hall. The trumpeter blows into his instrument, but the sound never leaves the trumpet," DeMarco said. "That's exactly the case in our experiment, although we use quantum matter waves instead of sound, and the barriers are created using a speckled green laser beam." To simulate electrons moving in waves through a metal, DeMarco's group uses ultra-cold atoms moving as matter waves in a disordered laser beam. 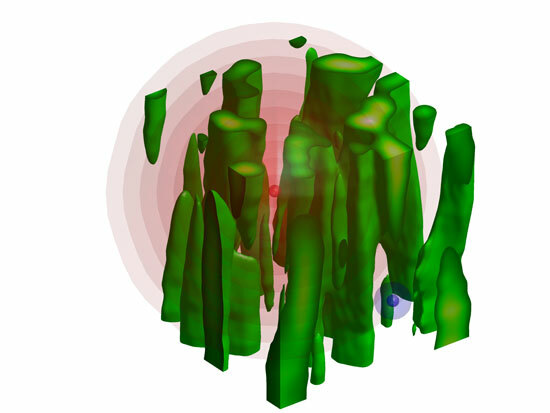 Using laser light as an analogy for a material allows the researchers to completely characterize and control the disorder - a feat impossible in solids, which has made understanding and testing theories of Anderson localization difficult. 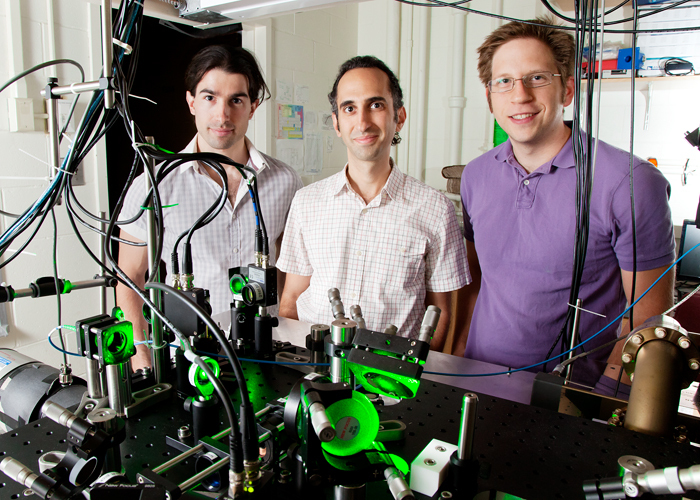 The researchers demonstrated that the laser light could completely localize the atoms - the first direct observation of three-dimensional Anderson localization of matter. "This means that we can study Anderson localization in a way that is relevant to materials," DeMarco said. "Now, theories of Anderson localization in 3-D can be compared to our 'material' and tested for the first time." The team also measured the energy a particle needs to escape localization, known as the mobility edge. Waves with energy higher than the mobility edge are free to propagate throughout the disorder, but waves with energy lower than the mobility edge are completely localized - even when there is a path through the barriers. By tuning the power of the speckled green laser beam, the researchers measured the relationship between the mobility edge and disorder strength. They found that as disorder increased, so did the mobility edge, meaning that materials with high concentrations of defects induce more localization. DeMarco hopes to use the quantum-matter analogues to better understand and manipulate materials. Eventually, he plans to use his measurements of Anderson localization and the mobility edge along with future work exploring other parameters to engineer materials to better perform specific applications - in particular, high-temperature superconductors. "Comparing measurements on a solid to theory are complicated by our lack of knowledge of the disorder in the solid and our inability to remove it," DeMarco said. "But, that's exactly what we can do with our experiment, and what makes it so powerful and exciting." The Defense Advanced Research Projects Agency, the Office of Naval Research and the National Science Foundation supported this work. Editor's note: To contact Brian DeMarco, call 217-244-9848; email bdemarco@illinois.edu.